When planning a wedding, shower, or another event, there are many decisions to be made in regards to the tables and chairs. Since these items generally take up the bulk of the room, it’s important that the selections made are going to give the desired effect. 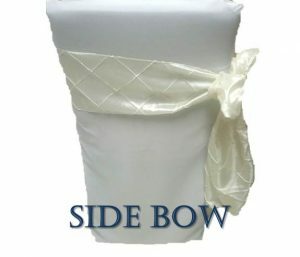 If you have decided on linens and chair covers, there are many chair sash alternatives to the traditional bow. 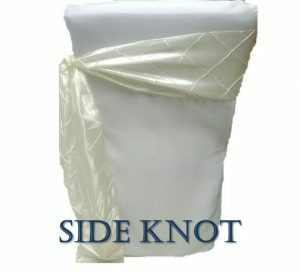 While none of these alternatives are tremendously tricky, the way that you tie the sash is not always intuitive. Listed below are pictures of each of these chair sash alternatives as well as basic instructions to help clarify on the difficult ones. 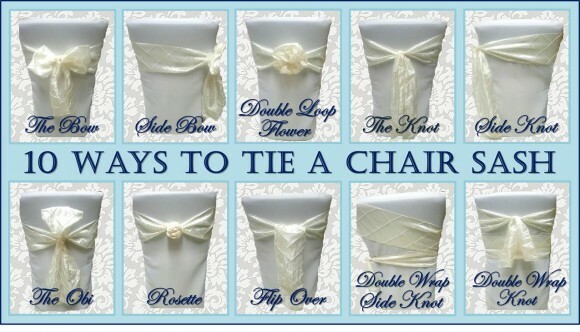 Some points to keep in mind when deciding on which chair sash tie to use are the length of the chair sash, the difficulty of the chair sash tie, number of people who will be able to help tie on the day of, and amount of time it takes to tie each chair sash. For some of these ties, a longer chair sash is preferred while others look better with a slightly shorter sash. If you have the sashes on hand, practice these beforehand, so there aren’t any surprises on the day of. In this tutorial, I used a white square back chair linen with an ivory pin-tuck chair sash. 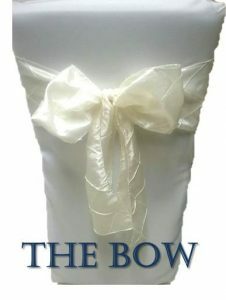 The traditional bow is a chair sash favorite for two reasons. The first is it is as easy as tying your shoe laces and the second is it is quick. To make the bow, hold an end of the chair sash in each hand. Wrap the sash around the front of the chair back. Cross the ends of the sash and loop one side over the other. Tie a bow and tighten as needed. This is the first alternative to the traditional bow and is super easy. To create the side bow, tie the traditional bow as seen in the first chair sash idea. Then slide it to the left or right side of the chair. 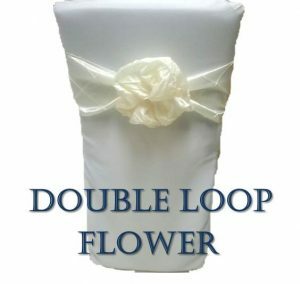 The double loop flower is similar to the rosette, but slightly faster to make. Although it is an easy chair sash, it does require more time than the first two options so make sure to have plenty of hands available if you need to do this for several (or several 100!) banquet chairs. For the double loop flower, follow the steps to make the traditional bow making sure that the loops are relatively small. Then, make another bow with the hanging ends. There should be four loops and two small hanging ends. Fluff the loops and tuck each loop over the adjacent loop. Then take each end and lightly tuck it under (or over depending how the end is hanging). 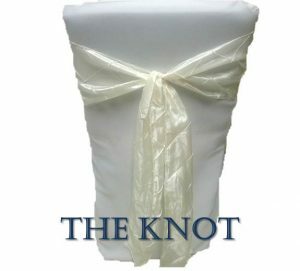 The knot is a very simple chair sash tie and is second only to the bow. It is one of the fastest and easiest alternatives providing a slightly different and less frilly look in comparison to the traditional bow. To make the knot, hold an end of the chair sash in each hand. Wrap the sash around the front of the chair back. Cross the ends of the sash and loop one side over the other. Tie the ends in a tight knot and let the ends hang down the back of the chair. Depending on the length of your chair sash and the desired look, creating a double-knot may be necessary. Like the side bow, the side knot is an easy alternative, with the knot placed to the side of the chair rather than in the center of the back. To make a side knot, follow the directions to the traditional knot and once the knot is secured, slide the knot to the left or right of the chair. 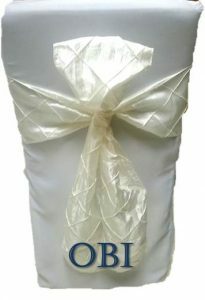 The obi is one of the more difficult knot forms and is more time consuming than the bow and knot alternatives. To create the obi, wrap the sash around the chair as if you were creating a bow. Flip one end over the other and pull. Now, rather than creating a bow, hold one of the ends in your left hand. Take the other end and wrap it clockwise behind and around the piece in your left hand. Pull the piece in your right hand under itself to tie it. If this seems challenging, an alternative to this is the one-looped bow. Rather than making a traditional bow, make one of the loops larger and leave the other loop smaller. Then make sure that the ends that are hanging cover over the smaller loop. 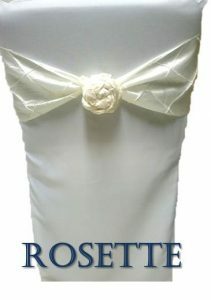 The rosette is another chair sash alternative that is beautiful, but more time-consuming. If you are going to do the rosette on a great number of chairs, make sure that you have plenty of time or people to assist. To make the rosette, wrap the ends of the chair sash around the chair as if making the traditional bow. Pull one end over the other to secure in place. Begin twisting one end of the sash over the other until you have a small amount of sash left at the ends (a few inches at most). Wind the twisted sash in a circle around the center back of the chair until a rose-shape is formed. Tuck the hanging ends to hold it in place. 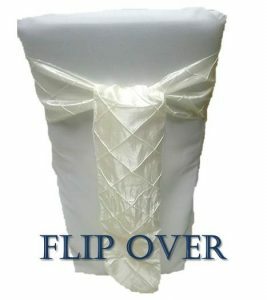 The flip over is a sleek alternative to the traditional chair sash and is quick and easy to make. For the flip over, follow the instructions to make a standard knot. Then take the longer hanging end and flip it under and over the top of the knot. Since this chair sash was a little bit longer, I flipped it over a second time to achieve the desired length. Straighten and smooth the flap as needed. 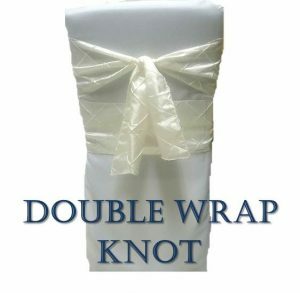 The double wrap knot can be a little tricky if there is not enough tension on the chair sash when wrapping it around so make sure to practice it a few times before the big day. 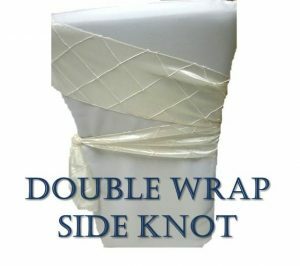 To create the double wrapped side knot, take the ends of the sash and wrap it around the side of the chair. Cross over on the alternate side and then loop one end over the other on the first side. Tie a knot or bow depending on the desired look and amount of fabric remaining. The double wrap knot is one of my favorites because it gives the chair an extra splash of color while still preserving the lovely aspect of a knot (or bow) in the center. To create the double wrapped knot, start at the middle of the chair (rather than the top). Take each end and wrap it around the chair crossing at the front (this is different than the other alternatives that crossed at the back). Take the ends and wrap it around the front (like a traditional bow) and cross over the ends in the back. Finish it off by tying either a knot or bow. Which one of these chair sash alternatives did you use for your special event?